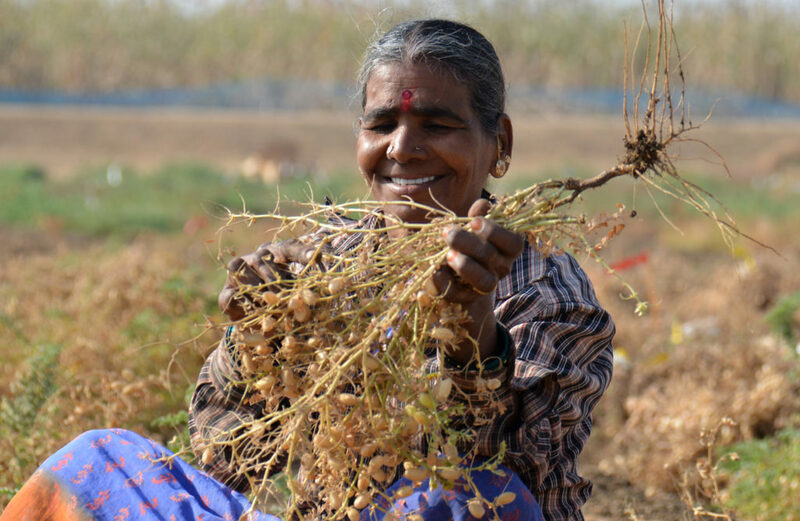 A recent study reveals that chickpea variety (JG-130) grown with balanced fertilizers including micronutrients and bio-fertilizers under rainfed condition recorded 15% and 40% higher grain yield compared to JG-130 and local chickpea variety grown without micronutrients respectively. 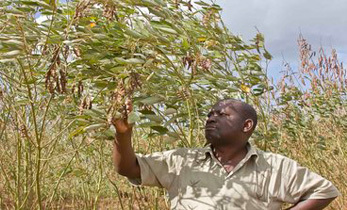 For groundnut the application of micronutrients increased groundnut pods per plant by 9%, seeds per pod by 6% and pod yield by13%. 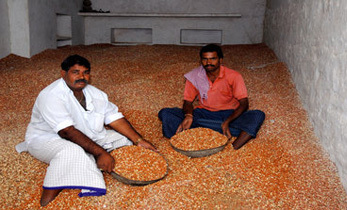 Application of balanced fertilizers significantly enhanced growth, yield attributes and yield of groundnut and chickpea. The net economic gain under balanced fertilization was ₹ 3,024 per ha for chickpea and ₹ 7,155 per ha for groundnut. 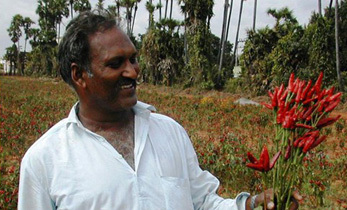 In addition to economic gains a positive residual benefit on the succeeding crops was also documented. 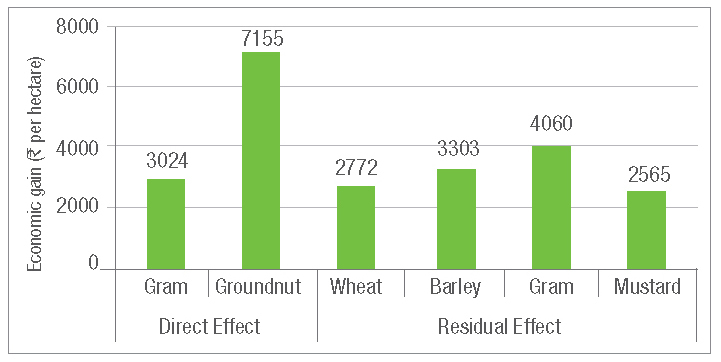 For example, the mean yield of wheat was 3,010 kg per ha as a result of residual effect. The yield increased by 231 kg compared to the yield (2,779 kg per ha) without the application of micronutrients. 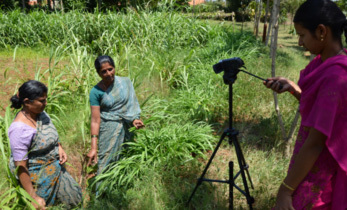 A three-year study carried out in severely micronutrient deficit semi-arid areas of Uttar Pradesh, India, shows that prolonged and overuse of fertilizers to increase crop yield has resulted in rapid depletion of micronutrients from soils. Instead of single nutrient deficiency, multi-nutrient deficiencies are emerging. Multi-nutrient soil deficiency directly impacts crop productivity and indirectly contributes to malnutrition. Economic and residual gains after micronutrient application. The beneficial effects of balanced fertilization are better growth and productivity of crops which resulted in lower production costs, better profitability, and improved chances of producing a good yield under adverse climatic and soil conditions. 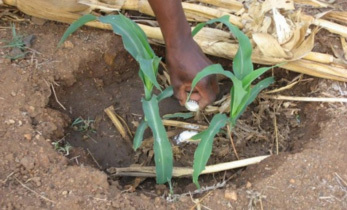 Results from this study also strengthen the argument that balanced fertilizer application is beneficial and necessary to ensure long term sustainability, especially in the context of intensive agriculture. 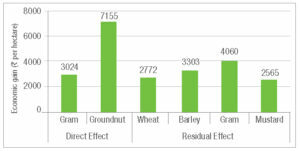 The research findings showed that 88% farmers appreciated the impact of balanced fertilization. However only 9% farmers actually used them. The unavailability of micronutrients and lack of awareness by farmers seems to be a major hurdle in scaling up the use of micronutrients. 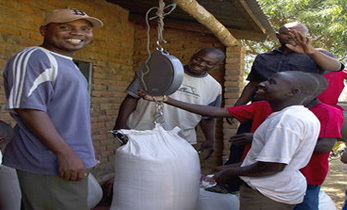 Hence a concerted effort is required by researchers, extension personnel, policy-makers, fertilizer industry and dealers to ensure micronutrient is available to farmers at affordable prices. Jhansi, is developing a model watershed in consortium mode with ICRISAT and Development Alternatives, a non-governmental organization. The findings of this research were published in the Indian Journal of Soil and Water Conservation and this paper has been selected as the best paper of 2016 by the Indian Association of Soil Water Conservation (IASWC).